One of the biggest mistakes I'm starting to hear from brides: Not hiring a videographer! Let's step back a bit and find out what's going on, ok? So first, I remember reading stats almost 7 years ago from couples response on the importance level and videography was considered least important of them all. Cake was more important. Video was only important to 9%. I remember the 9%. But tech back then is not tech today. We didn't carry hand held devices that can play video. Some did but something changed in 2008. Brides, let me introduce you DSLR! Why is it so important? And isn't that camera for photos? Yes it is a photo camera. But I remember buying my first 5Dm2 camera. A photo camera that can film, and it changed the wedding film industry. So you're saying there wasn't a camera that can film? Yes, and no. See before DSLR started to change the game, most of the video people would use cam corder. It's like buying a all in one. And the biggest difference between Camcorders and DSLRs is you that one can change lenses and the other cannot. And I'm sure you can figure out which one does the creative, movie like feel. So advice from previous couples may not be the best. Especially if they had horrible experience with their videographer. Give it some time and quickly you'll see that wedding cinema will be #1 very very soon. And I'm sure many of you reading this already see it happening. But at the same time many of you are probably not sure. Well, if you just watch one of my videos, most likely you'll be sure to get video. We get brides change their mind all the time. And that's because the ration between good photographer and cinematographer is not equal. I can point out and refer 10 awesome photographers and only 2 cinematographers in east coast. Why is this? It's hard. Videography is really really hard. Trust me! I've done everything with weddings and video and it seems like my wife and I have mastered it. We have not. The biggest challenge we have is turn around time. And yet most videographers get paid less than photographers. 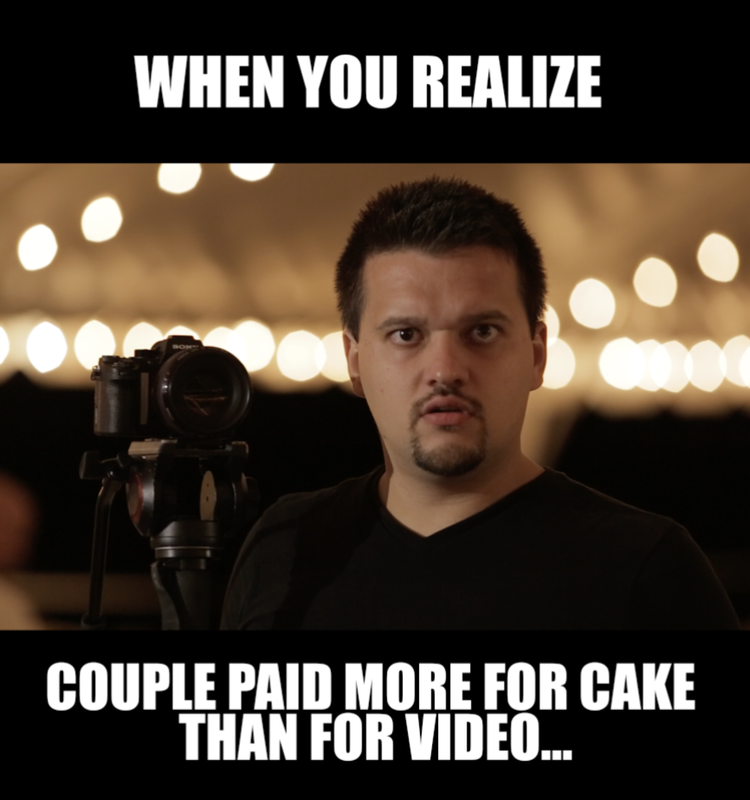 What's even more sad is there are couples that pay more for cake than for video. Thankfully that didn't happen to us. Being able to put it all together within weeks would be a dream. But no, I have to leave and shoot the next couples wedding. It starts to pile up. Next thing you know, I have 10 weddings to edit, each with 14 hours of footage + audio (this is being conservative) and time becomes of essence. Especially for the world we live in where Amazon can do same day delivery. How does this tie in with the topic of this blog Andrey? Glad you asked. This is what all videographers face. And most likely, couples will bother them. It is a nightmare when they text you, "when is my video ready". It's a pressure no one likes. Luckily, all our couples are awesome and patient with us because they know that time is quality. And time is the challenge videographers have. And photographers too. And I've seen very high end photographers get pressured too. And if you are about to marry + reading this, DO NOT pressure your videographer/photographer unless they take more than a year. Because that is only making them rush to make you happy. And then you're not happy because the rushed. And next thing you know they feel defeated for not being able to satisfy you and it makes them look bad. And then they quit. Then this videography wedding industry looks bad which makes me look bad! That is what I believe is making video still not #1 because couples do not know the grudge behind it. And not only that, videographers get paid almost twice as less than photographers. To me that does not make sense. It costs them 4 times more if not more, take 5 time longer to put together and is more intense. Let me put it in another perspective; Let's say you'll get 24 awesome photos from a photographer. And with video let's say 3 minutes. I'm making it short to make a point. So now you have your final product of 24 photos and video that's a combination of 4320 photos. Do you see the pressure here? Video consists of at least 24 frames per second. That's 24 photos per second. Or 30. I film at 30. There's 60 seconds in a minute and you have 3 minute video. 24x60x3 =4,320. Not just 24 photos. What does this mean? The video has to be clean and continues recording. One wrong move and 1,000s of moments can be missed. That's how much more pressure we have. So think about it and treat your videographer nice. Because he or she may be doing the most heavy lifting. For me, all our couples love our work as much as we do and they are awesome and we thank each and every one of them. If it wasn't for them, my wife and I wouldn't have gotten this far. And trust me, I've been in dark places. I literally thought of quitting, selling all my gear and working in Home Depot. I remember thinking those moments. Even after filming our NFL weddings, it's still hard. But the only reason why I did not quit is because I love what I do. If your videographer loves what he does. You are in for a gem. Just don't make a mistake of pressuring them. Give them time. Just ask when you can expect and then leave them alone. If they are posting videos occasionally, then it shows they are working hard trying to get all the other weddings done too. For me, I would need sometime even up to a month to get a wedding done. Not because you may have ordered the longest edit, but because I've had many other brides order an edit and I may very well still be working on theirs. You are not the only one getting married. Sorry if this seems like a fuse of. It's not. This is merely an education. This is not communicated enough and I think 100% transparency will help both parties understand! If your videographer is willing to be patient with going through hours and hours of your wedding footage, right after finishing previous hours of hours of another wedding footage, then be patient with them too. It's not their first rodeo. Try watching "Note Book" 100 times a month. You'll kill yourself. That's what many of us have to face and it makes a world difference when we hear our couples say, "Andrey, take your time, we want the best and can't wait to see!" instead of, "DID YOU START OUR VIDEO YET?????" The transition from old tech to new tech is still a bit foggy. But it'll clear up soon. I've been doing this wedding stuff for 5 years now and still figuring out with my wife. And many times, video is under appreciated because majority of the videographers quit or give up. And I know many times is because the bride and groom put too much pressure on them. Just communicate in the beginning. Even for the videographers. Communicate with your couples. Tell them how long it could take and if you need to extend it, just be real and share the situation. No one is perfect. The only thing everyone want in the end product is timeless presentation that will last with them forever. Now lets' talk about that. Why is sentimental more valuable than just a front page creative photo of you two? Well, because you'll get sick of the color red. Paint your room red and you'll love it. It's so nice and feels romantic, right? Well give it a few months and you'll be tearing the wall down if you had to to get rid of the red. You'll get sick of it. Just like you'll get sick of listening to Justin Bieber's latest hit song. Video is somewhat different. It may be long to watch, but it'll be valuable when someone close passes away. Or 20 years from your wedding day when your kids are getting married, they'd love to see how your wedding was and how mama and paps used to look hot and young and sound different and immature just like them haha don't get offended, it's true. And age is a beautiful thing that's inevitable, so accept it. But just to make it more interesting, I'll share the following scenarios that are downright 100% real that happened to us. One bride had her younger sister (who was her maid of honor and engaged too) pass away 1 month after her wedding in a car accident. Now get in her Cinderella shoes and imagine that happening to you. What would become more important to you? The photos you took with her or the video of you two laughing together, crying together, and even the sister sharing her personal toast. Do you see where I'm going with this? Ok, here's another one. One bride contacted me and said how much she regret not getting video. I even reached out to her because I wanted to film her wedding. It's not that she didn't get me, it's that she didn't even get video, at all. You know what she said to me? This happened when I was filming her sisters wedding because she forced her. She said she regret because they spent 10,000s on their wedding day with decoration, location, bringing people together, the details, dress shoes, and they only have a few photos. To be exact she said she only had about 10 photos of her reception decoration which is where she invested in most. She regrets it. Those photos and her foggy memory is all she has left. It's like the wind just blew away all that money. Are you going to be like her? Not get video, then regret and start forcing brides to get video. Don't make this mistake because it cannot be fixed. Even if you do have the money to get everything back together, it'll just not be the same. Because you're married now and you've seen everyone, etc. It'll just be just as good as a second fake smile. And even I regret she didn't get me because I saw the photos and the couple looked like the GQ couple. They were super hot and good looking. Kim Kardashian got nothing on them. And it blew my mind they did not get video. Really did. I was shocked. Don't do that. At least get crappy videographer, trust me. My sister had the worse video for her wedding and on her 15th year anniversary, finally decided to see it for the first time. I know this because I was there. We got together to watch it for the first time and it was the best experience. Seeing all my uncles and aunts at their young age. I was like 6 at the time. Seeing myself being the ring boy. Oh my gosh we laughed and we cried and watched through the whole actual 4 hours of horrible random recording, and this was with a camcorder. She did not regret it anymore. It's memories. No photoshop. Just genuine, real people, real moments. The best nostalgia I've had in my life so far. I've got more. But seeing how much I'm writing already, I should start summarizing it up. If I didn't convince you by now, then God help you. I will not be convinced that you do not need video until I hear from at least one bride say, "I don't regret not getting video". Find me one and I'll delete this post. You all need video, even if you think you don't. Just trust me.